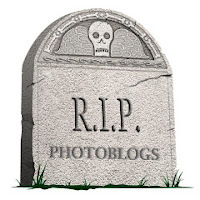 2011 was a rough year for photoblogs with many falling by the wayside. A few were killed instantly in one post through the heart. Most passed away quietly in their sleep. Some were abandoned in a state of suspended animation, and now haunt the blogosphere as the living dead. And a few rose like Lazarus from the beyond. Let's take a moment now to remember those who fell in 2011. May their short lives be a reminder to other photobloggers. If you're considering snuffing your blog in 2012, just remember that someone cares. Someone is reading you. Choose life instead! Nowhere Man (2010 - 2011) — A true original, Andrew Stark's writing was as fresh and wacky as anything online before it ended this spring as suddenly as it began. Exposure Compensation (2006 - 2011) — Cause of death unknown. Miguel Garcia-Guzman was going every day like a rocket before suddenly dropping off the face of the blogosphere. 5B4 (2007 - 2011) — Although last rites have not yet been read, 5B4 hasn't had a pulse in several months. Big changes for Jeff Ladd as he had a firesale of books, moved to Cologne, and his writing was elevated to print form. A void in the blogosphere which has yet to be filled. Down Or Out (2006 - 2011) — Mikael Kennedy put to rest the online version of his ongoing Polaroid series, now archived under Passport to Trespass. Some books still available but no new posts. Photo Musings (2006 - 2011) — A few years back this was daily reading, but it has faded. Tim Atherton made a few stabs at resuscitation in 2011 but it's now a ghost of its former self. Kurt Tuck (2009 - ?) — False Alarm. Pulled a Lazarus on us all. Darius Himes (2007 - ?) — Same deal. Appeared lifeless before miraculous Christmas Eve revival. Himes has a lot of plates in the air. Manchester Photography (2007 - 2011) — Mark Page wrote more than 1500 posts before petering out this year. Officially bit the dust 2/21/11, sort of. He will be missed. Mark Power (2008 - 2011) — Never a very regular poster but when he did write it was some of the most, er, powerful commentary on the web. Shane Lavalette (2006 - 2011) — For a while Lavalette was on a run, reviewing photo books left and right, but it never turned into an ongoing thing and the blog now appears dead. Rachel Hulin (2008 - 2011) — Hulin suspended her blog for maternity leave, and it's still in limbo. A new baby tends to put priorities in perspective in a hurry. While Seated (2007 - 2011) — During the glory years Michael David Murphy consistently churned out quality pieces. His archives are still a rich resource of past articles, especially for street photography, but new posts are no longer being generated. Daniel Shea (2007 - 2011) — A blog recounting Shea's various photo projects and adventures, this blog gave great insight into the daily workflow of a fineart photographer. When Sheas' Plume finished the blog was killed off. Because It's There (2010 - ?) — One of the undead roaming the blogosphere. Philippe's blog may still be revived but hasn't moved in a few months. Touching Harms the Art (2006 - 2011) — Stick a fork in it already. Photography Interviews (2009 - 2011) — A tragedy this one died so young. It showed promises of great content but never made it out of the crib. Facebook (2004 - ?) — Tough to forecast the future of a 7-year old but at this point it appears bound for immortality. May convert the rest of us into zombies in the process. If you know of others which should be added to the list, or if I've listed any here in error, please let me know. Urgh, this is a mighty depressing post. There's so little (direct) feedback on interesting blog entries that it surprises me when the blogs keep on going. Consider Mrs Deane: I seldom comment, but I see at the top right that three of the five most recent comments are by me. Could one or more other people please post half a dozen comments there -- mostly for the pleasure of reading them, but also so that I could post another one without appearing to monopolize the conversation? Two shocks this old year: First, when (under my "real" name) I commented appreciatively on the fascinating, most recent post in one of the blogs you list -- a blog that never had a newer post; did I somehow kill it off? Secondly, when Oitzarisme (which you could have added) vanished very shortly after I first discovered it; it came back (though frozen), and I wrote what I thought was a cheery message, but a grand total of one person joined me in expressing any interest in future posts. I hope that Constantin does indeed bounce back on 16 January, but in his place, and with the minimal feedback he's got, I'd probably jack it in. Microcord, when I end B I will give you the last comment. Anton kusters blog rarely posts now (http://www.antonkusters.com/) although he did post 16 days ago, it seems rare and far between to see a post nowadays. Paul Russell's blog appears to be dead as well (http://paulrussellinfo.blogspot.com/). Sorry, not sure how to post links besides doing it like this, B. All this doom & gloom is just a disguise for opportunity. Clearly these niches are appreciated -- and can be filled by other bloggers who are ready and waiting for the chance. I often wonder what happened to Nowhere Man. We worked on a project together for Street Reverb mag and were discussing another but all fell silent. Andrew, hope everything's okay. Would it not be interesting to inquire into what happened to the people writing the blogs (beyond the maternity leave)? We ourselves are indeed less active than we used to, but our blog has spawned so many other activities consuming my time (and making the much needed bread and butter on a quite modest table). Sure I would love to be able to come back to posting full force, and keeping up the conversations it spawned, plus there is enough stuff going on to muse about, but until the income problem is solved, I can't see it happening. This is the issue that kept coming back in blogger meetings, and one that apparently hasn't been solved yet. Makes it more important to look how the remaining blogs do manage to continue bringing essential food for thought to the table. And yes, please add to that a list of new blogs that have sprung up. Might help to chase back the gloomy mood to that abyss it came from! I can't think of many new blogs that sprung up in 2011, and in fact that gets to the point of the post. I suspect that we're witnessing the tail end of indie photoblogging's glory days from roughly 2006-2010. I don't think many new ones are starting up. Most of the energy is directed now to other social media. I'm not writing this with any sense of nostalgia but trying to pin down historically just wtf happened in the past 5 years. Was it a movement or ??? It's a bit like the photo postcard craze around 1910. Within 5 years it was over. I wouldn't look at these sites as 'dead' or 'killed.' As anyone reading this knows, Alec Soth had one of the glory day's best/most widely read photo blogs, which he stopped writing. But he is now publishing fairly regularly at his company's blog (http://littlebrownmushroom.wordpress.com/) and tumblr. Changing venue, or at least updating the scenery is probably something most creative people respond to. If the blog or site has the same template or design since 2006, it might feel less inspiring to actively create content to post to it. One of the great things about many photoblogs is the content does not expire. A good interview or discussion of a book or series is going to be interesting to somebody in a few years. It's still easier to find and access this content than anything published in an actual publication such as the New Yorker. One of the problems with the old blog format is the date-based archiving - more space in the design is given to sorting content by date then by category (usually too broad) or other methods. Date-based also emphasizes that looming "I haven't posted here in 6 months" feeling. Tweaking the design can make the author feel like "wow look at all the awesome I have here" and hopefully inspire more posts. I followed many of the sites on this list and learned a great deal from the intelligent people that wrote/produced them. To them, thank you! Not so much a blog, rather an "online photo exhibition/dialogue space", Too Much Chocolate folded. (according to founder Jake Stangel's website: "rip due to hackers"). As for newcomers, Gwen Lafage's blog, Carte Blanche, started in early 2011, and recently opened her brick and mortar photography gallery in SF. I noticed now that Jacques Philippe hasn't posted on his flickr stream for two months, about as long as his blog is in hiatus. Nothing worth its salt should be anything but print. If it can't sell as print its just adding to the noise and in the end will fizzle. Good bloggers shouldn't be giving their good stuff away. On new photographer blogs: Kei Orihara (terrible Wikipedia non-article), who put out one book about photography and one photobook back in the last century, suddenly started a blog in July. The text is in Japanese: no big problem as the main content of her blog is her photos (of Queens, NY). @ Zisis: I am going very well. I might post on my blog in the coming weeks. I too hope Andrew Stark is OK. He is one of a kind. Great article Blake. Hopefully photo blogs won't die out completely, but I guess it was overcrowded and some culling of the herds was necessary. But my main worry is that thoughtful blogging will just fade away for the most part as people switch over to smartphones for the majority of their internet use. I think the days of the 'information highway' are nearing an end, at least as far as casual, non-work related use. Twitter seems to me to just be a venue for the 'one-liner'. Everyone is a comedian. 'Liking' something has replaced comments. My take is this. As a result of today's multiple options, which are available to us and which allow us to communicate our thoughts and observations on photography and image making. The blog has mutated, evolved and developed. Surely what you are describing is a migration of those talents across and to a new series of platforms. It is sad that a number of informative blogs have ceased but maybe some ran out of things to say and others found them too time consuming on a non commercial basis. The others moved on, the committed stayed. The information is still out there, it is just being accessed in different ways. Which is an exact parallel to how we access, share and why we create images today. We are all telling stories, it's just that the shape of the book has changed. The information is appropriate to each platform and rarely repeated. Maybe that is the future. Know your content, know your reader and then decide the platform for each. The blog will continue just on a more niche basis, just like print! Amy Stein had a beautiful baby boy this year so that may be the answer to her blogs mysterious abandonment. Went offline sometime between the time I wrote this post and 1/5/12. Chalk me up for 2012.